One of the great things about having a social network on Ning is that it’s fully self-contained. You can host discussions or share videos and photos, all in one place. That said, many people have other websites and set up a social network as a way for members to get to know each other and join the conversation. If you have another website or blog, you can create a seamless experience for members and visitors clicking between your social network and your other site. There are a number of built-in tools on Ning that give you the power to do this. Let’s start create a website on the Ning. Add your social network’s badges & media players to your website: Your social network has built-in badges and media players that are designed to virally spread content. Because they are customizable and branded with your social network’s watermark, these media players and badges are easy to integrate on your website. 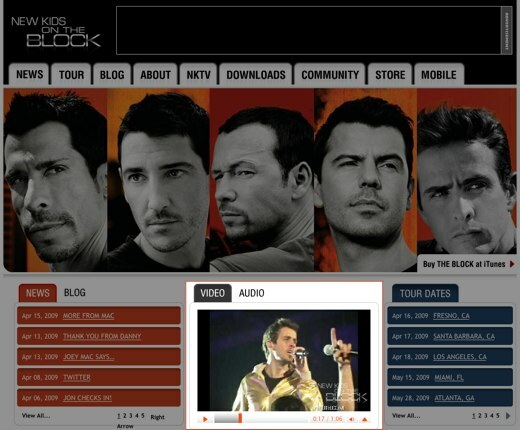 The New Kids on the Block place the built-in video player front and center on their main website. Clicking it brings you right to the social network. Use RSS to export and import feeds: If your social network is public, all types of content on your social network generate RSS feeds. You can add an RSS feed for the latest photos, videos, events, or forum discussions to your external website. In addition, you can keep members up-to-date by pulling in an RSS feed of a news source or blog from an external website onto your social network. The Harry Potter social network MuggleSpace pulls in a newsfeed from its parent site, MuggleNet. Integrate the look of your social network with your external website: Compare Push with the main site PickensPlan.com and you’ll see how powerful text boxes and custom CSS are when it comes to creating a seamless transition between your social network and your website. Use a subdomain for your social network: With Premium Services, you can point your domain name to your social network. Take this opportunity to create a catchy subdomain to complement the domain of your website. The List Project’s social network is a great example.